Trigger point therapy is a form of soft tissue therapy that applies concentrated pressure (usually finger pressure) to hyper irritated areas of spasm and pain in muscles. When pressure is applied to the involved muscle, pain is usually felt at a distant area and this is called "referred pain". Injury to muscles gives rise to pain, which activates a spinal reflex mechanism. This causes localized muscle spasm, decreased blood flow, and accumulation of byproducts of tissue damage or toxins. Adhesions then form in the muscle fibers, giving rise to trigger points. 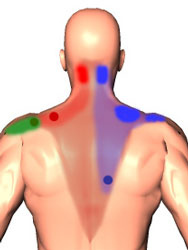 It is important to keep in mind that trigger points may be present in muscles for a number of years without causing obvious symptoms, besides stiffness in the muscle. Straining a muscle, emotional stress or extremely cold temperatures may cause trigger points in the body. Prolonged stress and muscle spasm may lead to neurological symptoms, such as pins and needles in the hands.